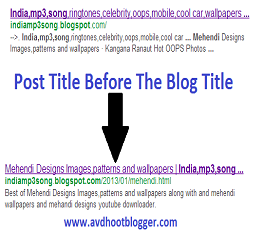 How to place Page or Post title before the Homepage title of blog or website, Blogging tips to add homepage title or blog title after the page title with SEO tips. Placing page title before the homepage title or blog title has tremendous SEO importance. From SEO point of view if you place or add page title before the homepage title it will increase your traffic. In this post I will provide you a code that will place page title code before the homepage title and hence it will help you to get organic search results which is the main part to get success for blogging or website. 4 Type of Popular Post Widget For Blogger. Always try to keep your page title short and specific. For example if you are writing a post about how to increase traffic then do not use crappy words to become different from the others. Lets the Google spider clearly understand the meaning of your page title. Get high search volume keywords from Google Adword tools but remember use low competition keywords because if you use high competitive keywords it will be difficult for you to rank on the first page of Google with those keywords because lots of reputed websites have already got success with those high competition keywords. So always try to use low competitive keywords with high search volume. You do not need to add any kind of blogger widget to execute this just add a simple bunch of code and replace the old one and the work is done. And now replace the above code with the below code. At First before applying this code when you search your blog in search engines then it shows the results like this. It is the case of indiamp3song blog when I search Mehandi design with search engine than Google displays results like this. Check here blog title appears first not the post title. Now after applying code in the template now I check Mehandi design on Google than it shows post title first and than blog title. So use the above code in your template and check your blog in search engines, your post title will appear first and then your blog title. Description : How to place Page or Post title before the Homepage title of blog or website, Blogging tips to add homepage title or blog title after the page title with SEO tips.